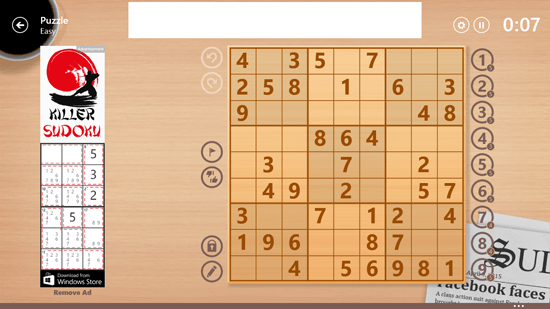 Sudoku Free is a Windows 8 and 8.1 puzzle game to play the classic game of Sudoku. Sudoku is a puzzle game that has a simple game play wherein there are 3×3 grids having 9×9 grids inside them. Each block consists of numbers from 1-9 in them, the game method is that you have to keep in mind that each row and column has the same digit only once. You cannot repeat the same digit in the same row or column. The interface of the game is responsive and has sideways parallax scrolling like the default Windows 8 and 8.1 applications have in them. The colors chosen for the background, images, text and buttons are all well combined and fall in same color shades. 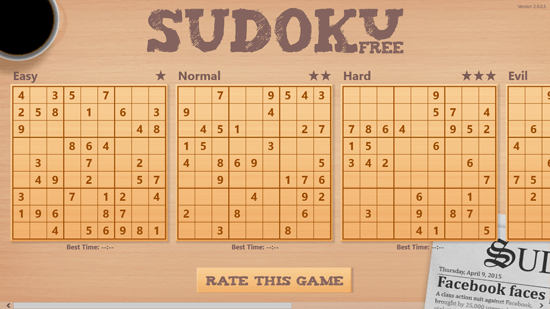 Sudoku Free has easy, normal, hard and evil game modes. You can choose which one you want to play right from the dashboard of the game. Each game play mode has best time stamp below it. When scrolled towards right side of the game screen, you will see daily challenges according to the category of the game. It will also show which player played it and his best time. When you start a new game, near the Sudoku puzzle there are different options including undo, redo, hint, validate, lock mode and notes mode; the numbers on the right side show how many times they are to be used in the game. To insert any digit in a particular grid, you just have to click on the block and then click on the number you want to place in it. On the right click anywhere on the screen of the game, you will see different menu options pop-up. These include tutorial, clear notes, save puzzle, print, stats, reset, solve and new puzzle. People do think that Sudoku is a difficult game, it might be but moreover it is interesting to play. The only brainstorming you need to do is how and where to place the numbers from 1-9 in the puzzle.